What's the Yackandandah Model of Care? 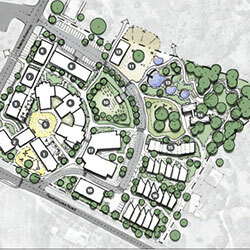 In 2018 our master plan was revised to reflect community interest in both childcare and environmentally friendly, communal living townhouses. With Archer Architects a staged master plan was developed to include re-use of the former acute hospital building as a state-of-the-art childcare centre, which aligns with our intergenerational model of care. 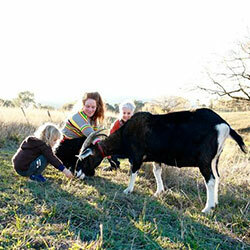 In 2018 a proposal for a Care Sanctuary was supported by the Yackandandah Community in the Victorian government’s Pick My Project initiative. This will provide a space where all members of our community can interact with therapy animals or spend time in a productive garden. Plans for the garden, barn and animal accommodation will be finalised and the project started in 2019. One section of the original hospital will be refurbished as a Childcare Centre for 66 children with a nature-based playground facing Racecourse Road. The front part of the original hospital will be refurbished for allied health and a gym. The entrance from Isaac Avenue will be reinstated. A new two-storey building is introduced, with a cafe, corner shop, lending library and reception serving both the village and the broader community. A double height atrium space will provide covered outdoor seating. Offices and meeting rooms will be on the first floor. Given the location of the childcare centre, nearby kindergarten and aged care facility, Yack Health will apply to have the speed limit reduced to 50 km/h to protect vulnerable road users. This allows for the introduction of a pedestrian crossing connecting pedestrians to the park, and path into town (a 500m walk). A new central courtyard will be created by removing dining and kitchen facilities. This becomes a major destination for the village and the broader community, allowing residents and children to interact. Existing aged care facilities will be refurbished to bring them up to contemporary specifications, increasing the amount of space per resident and improving connections to the outside. A new medical centre is introduced, with a glazed walkway connecting the village hub and acute unit. In the long term, an acute services unit will be reintroduced, drawing on Yackandandah’s history of the Bush Nursing Service Hospital. A new residential wing will be introduced for those in need of high care. It will be secure and have covered pick-up and drop-off for ambulances. Working with the topography, a new elevated deck will be introduced, with productive gardens, fruit trees, chickens and a pavilion, providing a place to gather. Car parking and water tanks will be hidden underneath. Given the rural location, many former residents have a farming background. Older and younger visitors can meet and look after sheep, goats and cows in the hobby farm. This stage will be realised in 2019. What will the community hub look like? The vision is for a space that can be used by residents and the public to facilitate wellbeing and community interaction. As well as providing space for current services, it may provide areas for new services, a cafe, a home for community groups, courses or meeting rooms. We will soon develop a concept plan based on community input.